Most of us do have our family favourites and of course what we call comfort food that remind us of what Mum used to cook up. I have a few and I always do them hoping that my family will enjoy them too. Sadly my boys aren’t really into cauliflower and therefore don’t like cauliflower cheese. To me though this is an ultimate side dish to accompany any meat or even a sunday roast and I love it! The origins of the dish are a bit sketchy. Wikipedia calls it an American dish, but I’m sure we had it in the UK before they did. The cauliflower supposidly originated in Cyprus and as Cyprus was was a former British Colony, it makes sense. Also béchamel sauce was used extensively in Cypriot cooking in the last couple of centuries too! The cauliflower was said to have been introduced to the west during the French Lusignan rule of Cyprus and the old French word for cauliflower is chou de Chypre which translated is the Cyprus cabbage. Britian then intoduced the cauliflower to it’s colonies and of course it is a staple in Indian cooking! So there you have it and now on to the recipe. In a large pot of salted water boil the cauliflower for 10 minutes, drain and remove to a casserole dish. Don’t over cook the cauliflower or you will get a mousse! Next up is the béchamel or white sauce. Here I am not going to worry about the onion and cloves so we will just melt the butter in the pot then stir in the flour. Mix until it is a nice paste and then slowly add the milk. You can warm the milk first or pour it in cold, really it doesn’t make that much of a difference. Okay so you are slowly mixing in the milk and bringing to a slow boil. It will start to thicken so now add the mustard powder and about half of the cheese and you can take off the heat and it should be fairly thick by now. Taste and then season with the saltz and pepper and add the nutmeg. 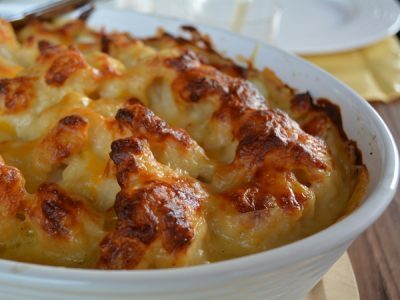 Pour over the cauliflower then sprinkle the remaining cheese over the top and bake in a 160°c oven for about 30-40 minutes or until it looks nice and baked. You can serve this as a meal in itself or as a side dish.